I am the simulacrum of happiness. for could you tell it was a facade? Or were you too busy with your own mask? We are all just characters of this masque. of a grinning, benevolent beast? Take off your mask and I’ll remove mine. across the floor of our masquerade? Anyone driving down I-75 in Ohio has seen the 6-story Jesus statue in front of the Solid Rock Church. And if they missed it, well they’re just blind. It has many nicknames such as Touchdown Jesus because of the way his arms were held aloft to the heavens, signaling a score for God, or my personal favorite, Big Butter Jesus. Because yes, the Lord did look like he was carved out of butter. The Heywood Banks’ song “Big Butter Jesus” became popular on “The Bob and Tom Show,” a morning radio broadcast that I severely miss because it’s not syndicated in DC. It’s alright, I’ve found the Kane Show out here. Well, Big Butter Jesus met his demise late last night when a bolt of lightning (probably from Zeus) struck his right hand and sent him up in flames. The church’s auditorium next door suffered minor smoke and fire damage. For the most part, only Jesus and his cross went up in the holy pyre. I find it amusing that Hustler Hollywood sign for the adult store across the street went unmolested. What I find more amusing though are people’s reactions. One guy said something along the lines of “Of all the things that could have been struck, I just think that that would be protected. … It’s something that’s not supposed to happen, Jesus burning” (Levi Walsh, http://www.daytondailynews.com/news/dayton-news/jesus-statue-fire-damages-estimated-at-700-000jesus-statue-fire-damages-estimated-at-700-000-762245.html). It was a giant statue made of Styrofoam and wood; of COURSE it would burn! Did you remember to bless it? Maybe that’s where things went wrong. 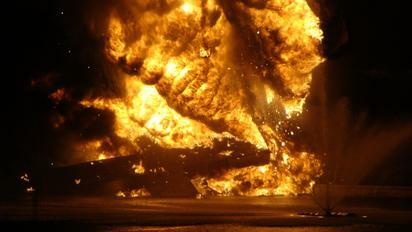 Or maybe the firemen ran out of holy water when trying to smother the flames of righteousness. Oh I’m just having way too much fun with this. The irony just tickles me. People can’t believe this could happen to a church. So nature is supposed to follow your beliefs as well? It’s a high point; it’s going to attract lightning. 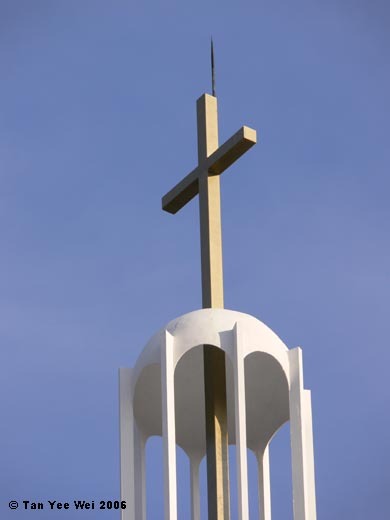 I think it shows a lack of faith when churches crown their steeples and crosses with lightning rods. Practical, yes, but since when has religion in our time ever been practical? Well, more like, when has religion in our time ever been reasonable? But these are the people who are supposed to be examples of faith. Why do they need lightning rods? Big Butter Jesus, that’s why! God is angry at their misuse of his name, his word, and his image. So he rains down judgment in the form of lightning. AWESOME. I would just like to conclude with “NO GRAVEN IMAGES.” Jesus, don’t you people pay attention to the one book that you actually read? Unless you’re Catholic, then you’re not encouraged to read it, but have it spoon fed to you during Mass. As I’ve stated before and it’s clearly obvious in this post, yes, I have a beef with organized religion. Mostly because of the fanatics and nutjobs and cults. You don’t need a church to worship in. You don’t need 6-story statues that looked like they were carved out of butter to worship to or show some sort of status: “My Jesus is bigger and butterier than your Jesus!” Think of all the money wasted to make that statue. I believe that I read somewhere that it was around $250,000. What else could that money have gone to??? Homeless shelters, battered women shelters, after-school programs, soup kitchens, starving children in Africa, starving children in any of the projects of any city in the United States, natural disaster reliefs, the list goes on and on and on. Stop trying to broadcast the fact that you’re a Christian and actually try to be one. Why is this such a hard concept to grasp??? Oh, one last thought. Maybe God wiped the statue from the face of the Earth because there was already a Touchdown Jesus at Notre Dame. 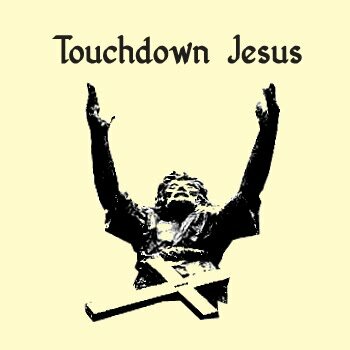 There can only be one TOUCHDOWN JESUS! Sorry no posts have come up as of late. Struggling with a lot of things right now. Mainly finding a new job and depression. Won’t bore you with the details. Just keep your fingers crossed and maybe say a little prayer for some luck to come my way?